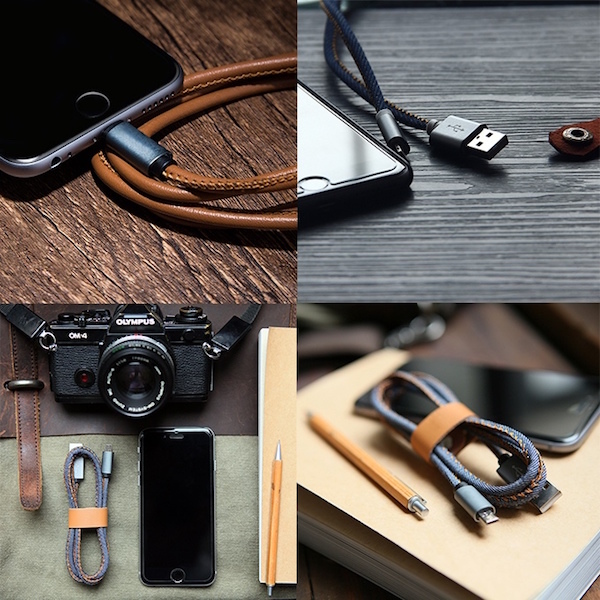 LMcable is a new Kickstarter project aiming to be the world's first cable containing a 2-in-1 connector that can charge both Lightning and Micro USB devices. One side of the 2.4A charging cable has a Lightning connector for iPhone, iPad, iPod touch, and other Apple products, while the reverse side has a Micro USB connector for devices like select Android, BlackBerry, and Windows Phone smartphones. 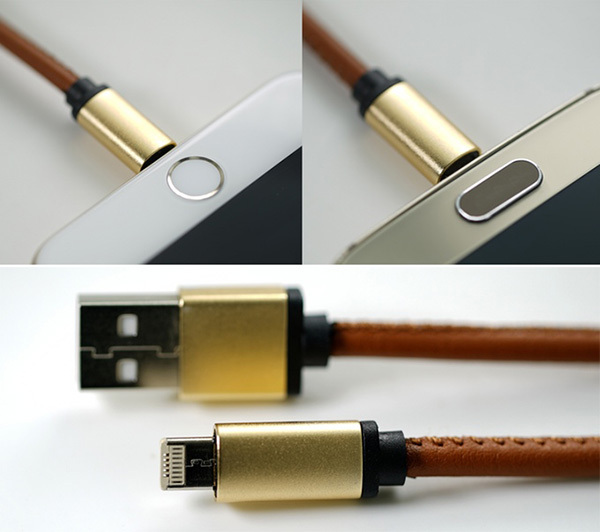 The stitched leather cable is about 1 meter long and designed with tin-plated copper wires for increased durability. A basic brass buckle is included that allows you to coil the cable neatly so that it remains untangled. Perhaps the biggest caveat of the LMcable is that it lacks MFi certification. Apple's MFi Program has strict guidelines, so it remains questionable if a custom Lightning-Micro USB connector would ever be approved as an official accessory. Another design tradeoff is that the cable lacks the reversibility of an official Lightning cable, meaning it can only be plugged into an iPhone in one direction like Apple's old 30-pin docking cable or a traditional USB Type-A connector. Nevertheless, LMcable is an interesting novelty that has exceeded its $5,000 AUD funding goal by nearly tenfold as of Tuesday morning. Like many other Kickstarter projects, however, there is no guarantee the cable will ever ship to customers. Those interested can pledge $21 AUD on Kickstarter to receive one cable, or $43 AUD to receive three cables, in Sunlight White, Vintage Brown, Moonlight Black, or Cowboy Blue. LMcable aims to begin shipping in mid-April barring any unforeseen delays. I will wait and make sure this cable doesn't explode phones. So, I lose the reversibility of my current lightning cable and it's not MFi certified? Hmm... Not sure this is going to work for me. Having said that the leather stitched cable looks really nice. The site claims that the Lightning port enclosure may be thinner than it currently is, but that it will still be fully compatible with current Lightning cables. We take the integrity of the Kickstarter system very seriously. We only suspend projects when we find strong evidence that they are misrepresenting themselves or otherwise violating the letter or spirit of Kickstarter's rules. As a policy, we do not offer comment on project suspensions beyond what is stated in this message. sorry, they lost credibility when they included a picture of a FitBit Charge HR on their website. This device does not accept MicroUSB or Lightning charging cable. Will this new cable work with my FitBit?? You think the claim that the new connector will work with existing Lightning cables applies to non-standard non-certifiable half-compatible cables? I think the claim that the new connector will work with existing Lightning cables applies to existing Lighting cables.